I’ve really been enjoying my fellow Speedhunters work from the Bonneville Salt Flats. I would love to go there at least once in my life, but in the meantime I can enjoy all these pictures which we recently got from our friends at Super Street magazine. You may have read yesterday’s story about the Dandy team with their Mazda FC -this is the most recent Japanese built car to have hit the salt flats… but it’s JUN Auto which probably has built the most Japanese Bonneville cars. Have a look here to see a breakdown of their Bonneville contenders. 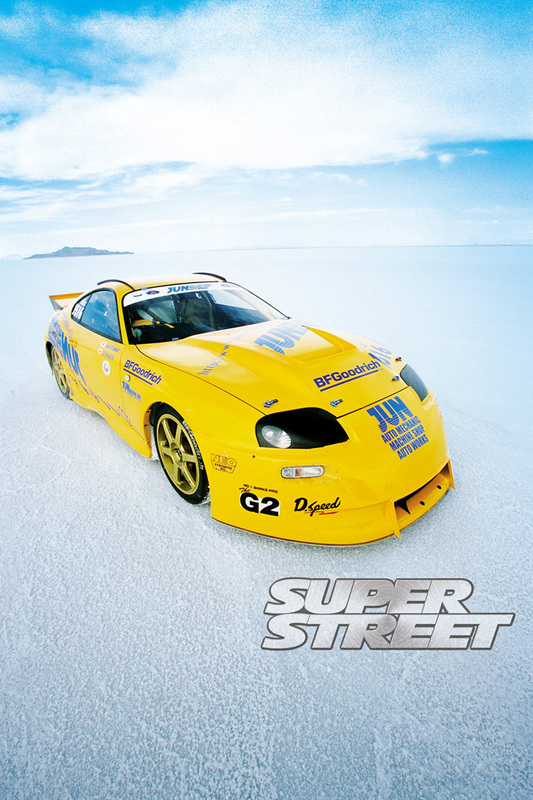 Their last campaign at the salt was back in 2001 with this Toyota Supra, they nicknamed the JUN Akira Supra. They entered the car in the E/BGCC class which translates to E: Engine displacement 3l -4.2l. B: Turbo or Supercharger G: Gasoline C: Competition C: Coupe. Here we see the car making its record run. The car was specifically built to drive faster than 248mp/h or 400km/h. On their first try they reached a top speed of 249.292mp/h or 401.20km/h with an average speed of 240.192mp/h or 386.55km/h. The car had to withstand enormous forces and had to be strengthened throughout. It also needed special aerodynamic enhancements. 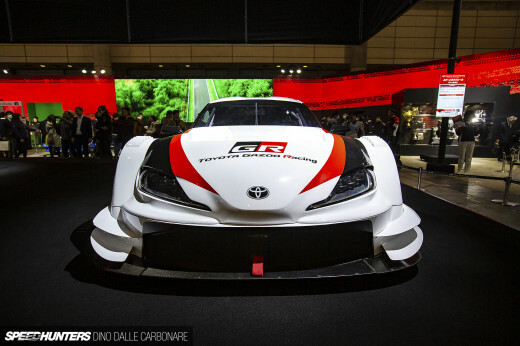 Because of this they enlarged the nose with a one off bumper. Inside the bumper are several ducts that lead to the turbos and intercooler. The hood was also raised to make room for the turbo piping and other hardware in the engine bay. What would a proper top speed car be without a functional diffuser? 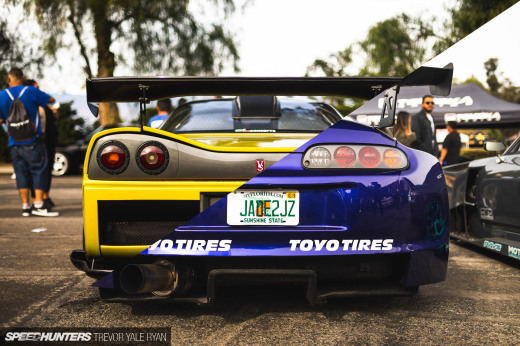 The regulations of the organization stated that cars can’t use spoilers/wings with stands so JUN made a ducktail design that suits the car perfectly. The chute is mandatory with the speeds these guys drive. Special BF Goodrich tires are wrapped around the 18″ AVS model 6 wheels. What I find funny is that they only up rated the brake pads. JUN always works together with Zeal to design the suspension for their specific projects. The heart of the beast is this fully reworked 2JZ engine. 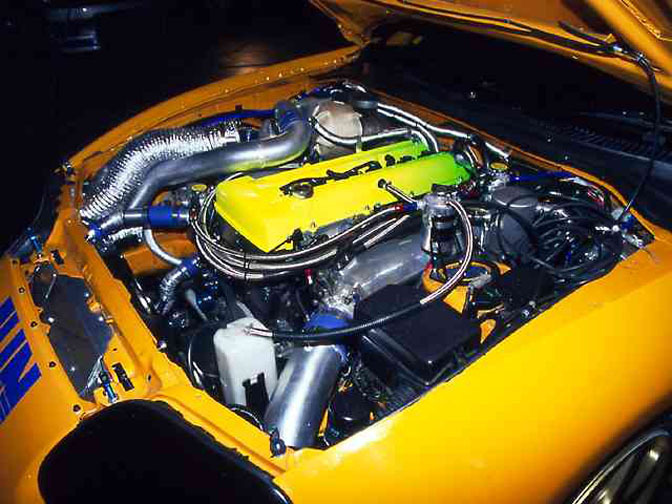 It featured a enlarged capacity of 3210cc thanks to JUN’s in house designed stroker kit consisting of pistons, connecting rods and crankshaft. All parts were specially designed for this car, so they were made at the highest specifications. To achieve the power output they needed JUN went with a twin turbo setup and called their good friends at Trust, they happily provided JUN with two T78 turbos. In the end the engine was rated 1200ps. It proved to be enough to get Jun into the record books. The engine has been mated to a 6 speed sequential transmission with a HKS triple clutch. Inside the interior it’s all business. It featured all the necessities used in a Bonneville competition car. One of the most important things are the chute lever that you can see rich next to the rearview mirror. 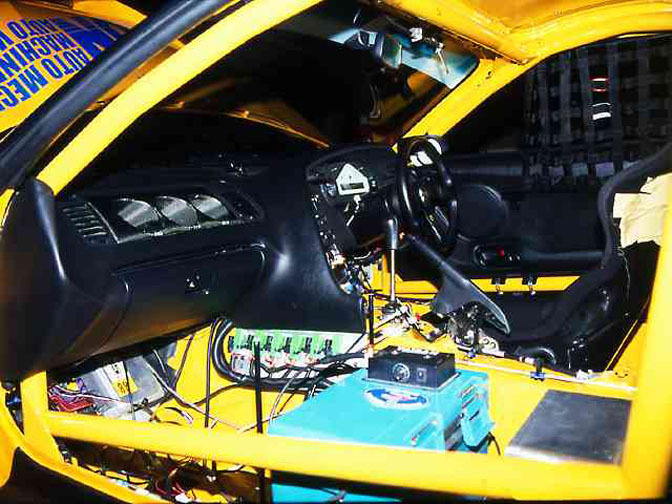 Other items include the data logging system and all the meters to monitor the engine vitals. 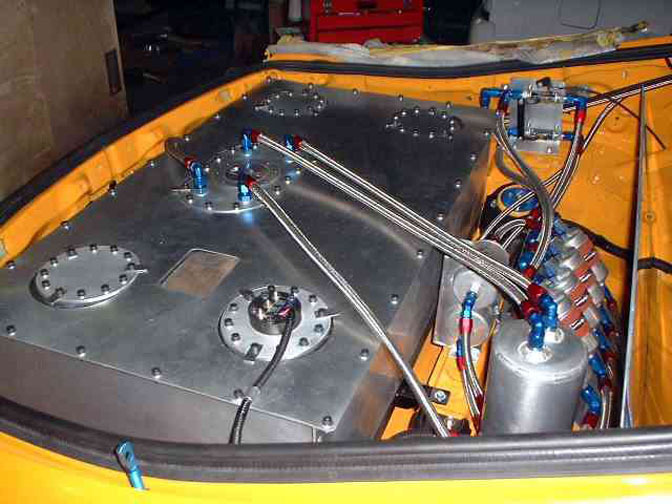 In the rear we can find this 120l fuel tank together with 5 Bosch fuel pumps and a collector. Perhaps in 2010 we see some more Japanese influence on the Salt Flats to break even more records. At least we know that one company is capable of such a feat! Thanks to Willie at Super Street for sourcing the images for this story. Eeek... all these pics are over exposed. Over exposure comes with the Salty territory. With 1200hp, I wonder what the hold up with the top speed was? Gearing? Tire diameter (essentially the overall gearing?) Aero? Any way, that's a killer cool supra. Insane!!! That is all that can be said about this Supra 1200bhp!? Sick! Could the new GTR be the future base car for JUN? OR How about the Veyron? 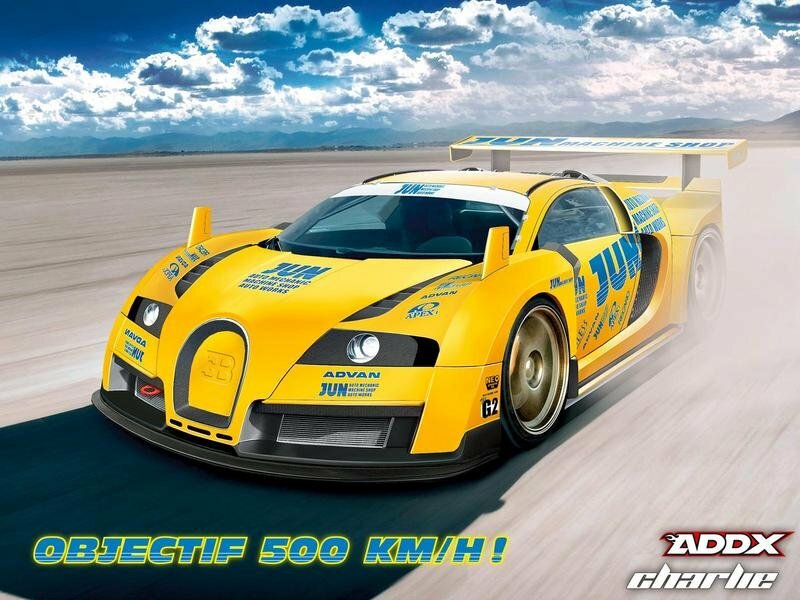 I saw a CG picture of a "JUN" Veyron on a french website. Could that be a weird, yet awasome selection? Or would it be sacrilegious? Any other ideeas for a possible future base car? Crazy stuff.....what ever happened to this car? :))) Cool, huh? What do you think? I would kill to see a JUN Veyron. This car was on the cover of the first issue of super street I ever got back in grade 7. I think it's decomposed since then. Ive still got the magazine!!! awsome car and possible the best place in the world. I remember this car, how could you forget it, but i never knew it sported TWO T78's!! NUTS! Willie? Haha I had to track down those photos for him! Sheesh! We love you too Jonathan! God... This article was already published by the magazine Max Power in 2002. So this is not even a little up to date.